Seattle, WA, CreateSpace, April 2015, trade paperback $11.99 (255 pages), Kindle $2.99. This is an interlude, because it comes after Book 3, Songs in the Year of the Cat, the last published, but before Book 4, Bones in the Year of the Dragon, which has not been published yet. “Before there was a Shogun, before there was a Journey, there was a Story. 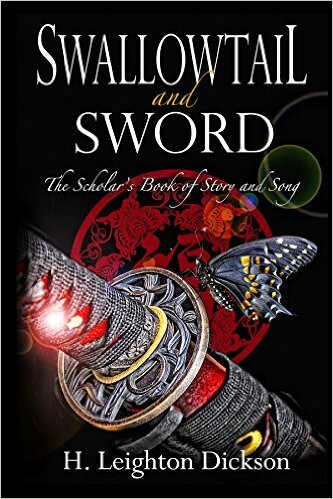 So begins Swallowtail and Sword: The Scholar’s Book of Story and Song. With stories, but there are also songs. And steel. “Much steel, for cats are warriors and our armies are the envy of the world.” (p. 8) And tea. And much more. If you have read Books 1-3 of Tails of the Upper Kingdom (and if you haven’t, why haven’t you? ), you will know of that far-future Oriental Empire, and of some of its politics and its expeditions to the far West and its discovery that humans still exist. And are preparing to reclaim the world. But before that story is told, here are glimpses of the Empire and of some of the main characters of the series. This is a collection of stories, songs, and poetry, but it is also a continuation of what has gone before. Not a separate novel; just an interlude. It’s what the Scholar, Jeffrey Solomon, thinks about as he prepares to enter Cryosleep for five hundred years, assuming that there is still anyone left after five hundred years to revive him. Those are the stories. Forgive me if I don’t enumerate all of the poems. Eight separate stories, yet this book is not a collection of stories, nor yet a novel. As Swallowtail and Sword is a volume of glimpses of the Empire, here are glimpses of Swallowtail and Sword. “‘Who is our third, Esteemed Masters?’ Kirin asked. “His face was gone, charred from the firepowder; one eye milky, the pelt seared from his forehead, nose and cheeks. When he pulled back his lips, they cracked. “Once upon a time, there were no rivers and lakes on earth but only the Eastern Sea, in which lived dragons: the Long Dragon, the Golden Dragon, the Black Dragon and the Pearl Dragon. One day the four dragons flew from the sea into the sky. They soared and dived, playing at hide-and-seek in the clouds. Eight stories, some poems, and don’t forget the tea. You are now ready for Bones in the Year of the Dragon. And while awaiting its publication, if you haven’t read Books 1-3 of Tails of the Upper Kingdom yet, hasten to get them.